About halfway through training for the marathon, I graduated from college and had to move my runs indoors. Likewise, the high mileage was exhausting, so I needed some motivation. Then came our law department with their fundraising for the Public Counsel, which offers free legal services for the battered and those who otherwise can't afford it. I personally prefer health-based groups, but since this was a company thing, I joined, raising over $100 (goal was $250, but oh well). Above is the shirt I received. 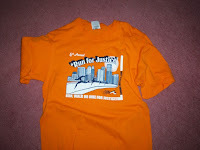 We were encouraged to wear it during the race, but the heat it would generate would have parched me. 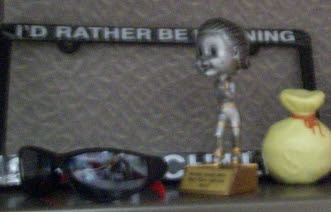 A few weeks later, we had a celebratory luncheon, where I received this cute bobble-head trophy for getting the fastest female time (out of 2) in the company. Also pictured on my work desk is a license plate frame I got in the Run for Justice goodie bag. It says "I'd Rather be Running." Unfortunately, I don't get to drive my car much, and my dad would not "rather be running" than driving. I enjoyed this experience, but I think next year, I am going to raise money for cancer instead, considering all that has happened lately. Running marathons is a good way to raise money. Anyone who runs one should capitolize on the chance to bug coworkers for pity money, because they think you're nuts for running so much. Speaking of desk, I also have this picture that Kwi drew for me for Christmas hanging there. It is titled "Hurry and Run the Half-Marathon." If you can see the picture, you will see that my shoes are talking to me, ha ha. That bobble head doll is hilerious!